BLOGBALADI: A [couple of months] ago, Rami Chemali, a Lebanese national and Star Academy participant, was killed in a car accident in Egypt. 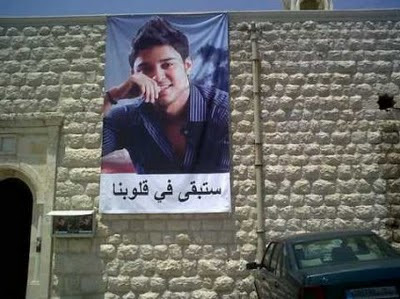 Mahmoud Shukri, Rami’s friend and also part of Star Academy was severely injured. Rumors spread that Rami was the one driving and a week ago, Rami’s mother pledged to sue Shukri’s family for falsely accusing her son of being the one responsible of the accident. Now the question is why don’t the Lebanese authorities bother to investigate the issue further? And how come no updates on the accident were heard since then? Is someone trying to hide the truth? On a final note, I found more pictures of Rami Chemali on an Israeli site than on all other Arab websites. Now why would Israeli websites be interested that much in a Lebanese star? And how did they get “Copyright” pictures of his funeral? "You will remain in our hearts"
Panet is a Palestinian site, but its hosting is in israel.